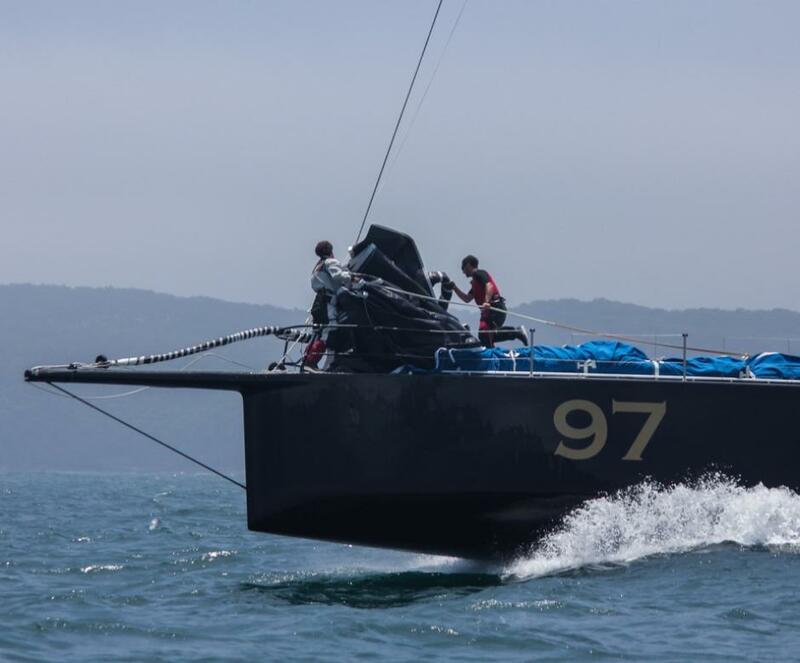 Guided by a full moon and making the most of the warm NE breeze the international crew of 17 on Karl Kwok’s 80-foot maxi Beau Geste took line honours tonight in the protracted Club Marine Pittwater to Coffs Harbour Yacht Race. Their official finish time recorded at the base of Muttonbird Island just inside the harbour was 21:16:45 this evening, Saturday January 3, 2015 giving them an elapsed time of 1 day 8 hours 16 minutes 45 seconds and an average speed of just 7 knots over the 226 nautical mile course. The Botin design launched at the end of 2013 is capable of speeds in excess of 30 knots. For the boat’s debut Coffs race the promised fresh nor’easters only teased, turning the usual dash into more of an amble. The most wind Beau Geste encountered was an 18 knot sea breeze this afternoon. Despite the slow pace “It was a very interesting race,” said Kwok on the dock at Coffs Harbour tonight. “The start was agonising, last night we had a full moon…it was real champagne sailing… then the last 12 hours were really good. We were not happy to hear Team Australia had a problem but accidents are part of the game, unfortunately. We had enough food and drinks to last us to the finish,” he assured. 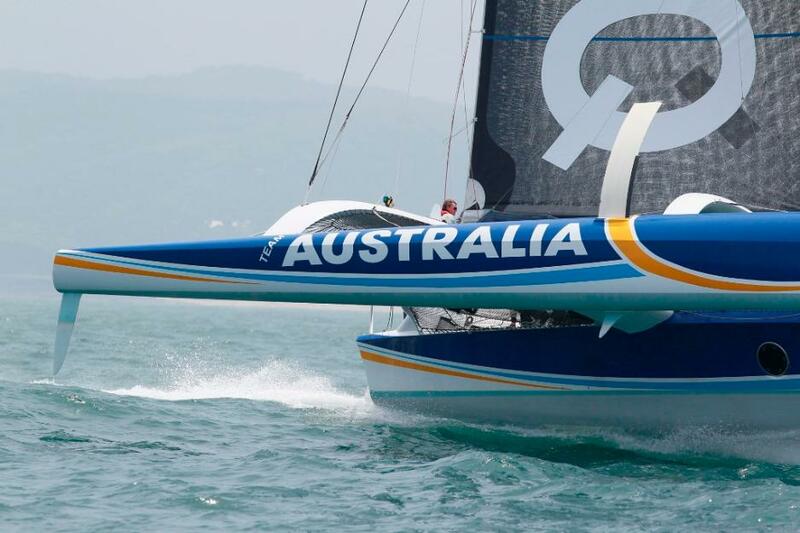 In a sudden disappointing turn of events in the Club Marine Pittwater to Coffs Yacht Race, race leader and multihull record holder Team Australia’s 100-foot mast came down late this morning when the trimaran was 10 miles out to sea south of Port Macquarie. 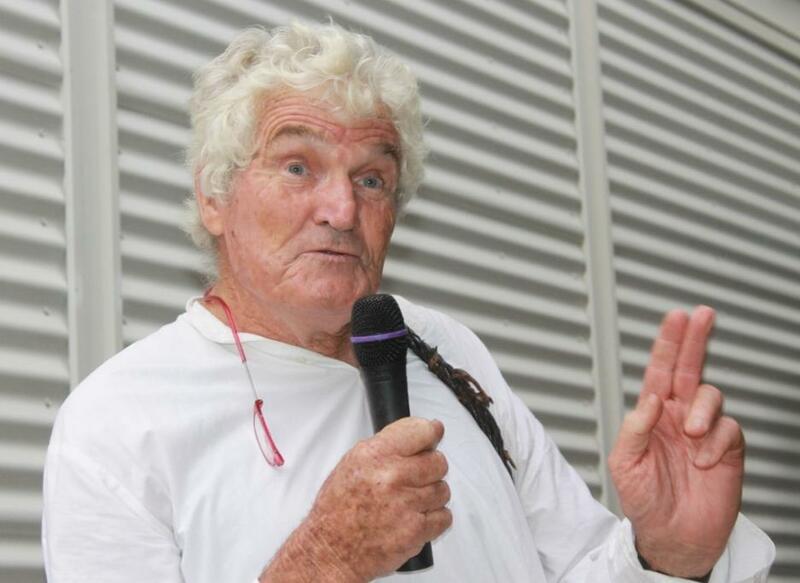 The crew of eight men on board the Sydney based 60-footer are all OK.
Ian Curlewis - picture by A J Guesdon, 2014. It was a great night on Friday, 2nd of January 2015 with 26 teams competing in the 5th annual Adrian Curlewis Twilight Masters Carnival, hosted by Palm Beach SLSC. Each year this fun on the sand during the first week of January becomes bigger. There were over 200 competitors, families and friends at the presentation following the events in the truer old summer residence, the Palm Beach clubhouse. 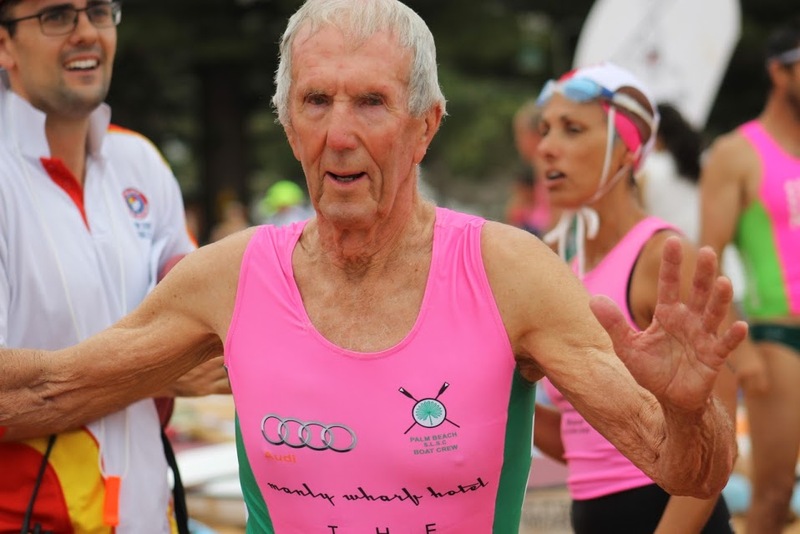 Named to honour the 'father of Surf Lifesaving' , Adrian Curlewis, a founding member of Palm Beach SLSC, this event is opened each year by Mr. Curlewis's son Ian taking to the water for the Swim. Richard Leplastrier - photo by A J Guesdon, 2015. A very crowded Avalon Community Centre showed the second ever Artspot – a biannual celebration of art show where you can buy beautiful works from premier artists, has quickly become one of Sydney’s popular events. Running until January 11th, Artspot 2015 combines the availability of works in many mediums with a number of activities associated with participating artists, including Talks, Workshops for Children and Adults and Demonstrations. 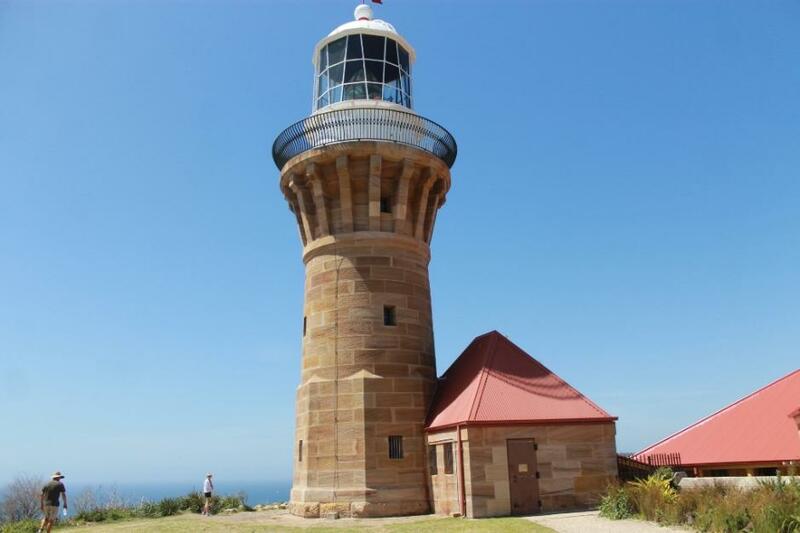 Barrenjoey Lighthouse - 1.1.2015 - A J Guesdon picture. 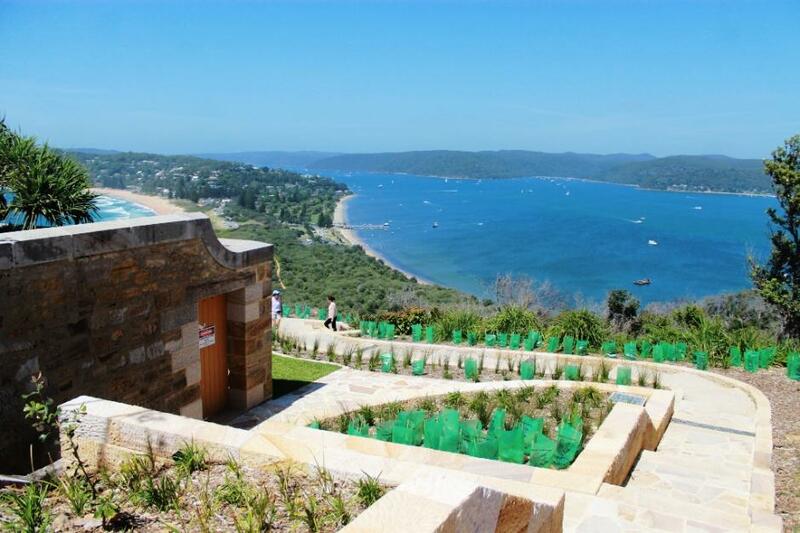 On New Year's Day, 1st of January 2015, we strolled up Barrenjoey Headland to show visitors staying with us around the iconic Barrenjoey Headland and have a look at the now completed restoration of the lighthouse works carried out in 2014. As you can see the lighthouse tower is looking pretty clean, almost new! The new sandstone flagged access trail to Smuggler’s Track, with landscaping and bushland restoration is a vast improvement on the semi-goat track that predated it. The headland is covered in green at present with a proliferation of Fringed Violet bushflowers. Flannel flowers, Bush Peas and Australian Rice Flowers have returned too - a very good sign to those who now a little about the indigenous lore relating to these Australian Bush Flower Essences. Healing has and is taking place after the devastating bushfire of Spring 2013. Still to come over the next two years is a further $1.6 million allocated by the current NSW Government for further restoration and conservation works on the cottages and other structures - great stuff! More images from Barrenjoey form part of this week's First Week of 2015 In Pittwater Pictorial.